THE GRAND ILLUSIONS OF ROB LAKE – SAHUARITA, AZ- MARCH 23 | Love Productions Inc.
One of the world’s most celebrated illusionists, Rob Lake’s mindblowing illusions have dazzled and entertained millions across network television, in Times Square, on the Vegas strip, Atlantic City, and before sold-out audiences in casinos, arenas, and theatres worldwide. His astonishing original illusions are uniquely presented as awe-inspiring storytelling on the grandest scale. Named “The Top Illusionist in the World” by Caesars Entertainment, the world’s largest gaming organization, Rob is internationally renowned for his mesmerizing and award-winning illusion spectacular. In 2008, Rob became the youngest magician in history to receive the holy grail of the magic world — the Merlin Award – as ‘International Stage Magician of the Year.’ This award is magic’s highest honor and the industry equivalent of an Oscar. Rob has also served as magic consultant for network TV series, feature films, and has created illusions for today’s most famous magicians. Rob’s magical effects can be seen in numerous theatrical productions across the globe including the smash hit musicals The Phantom of the Opera, and in over 900 productions of Disney’s Beauty & the Beast. 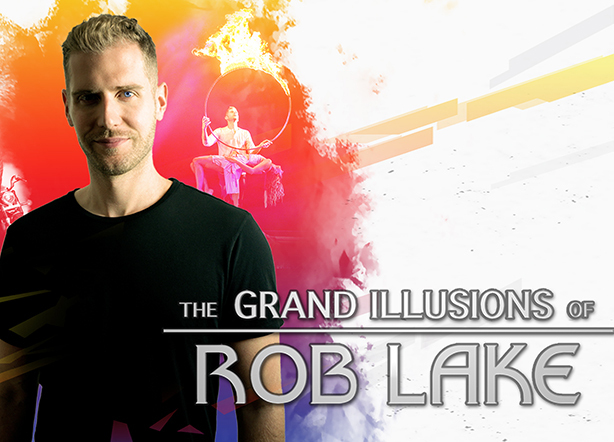 Over the last few years, Rob has headlined in venues around the world bringing his physics- and sometimes even death-defying illusions to audiences at the Atlantis Paradise Island Resort in the Bahamas, Harrah’s Lake Tahoe, and even the White House.